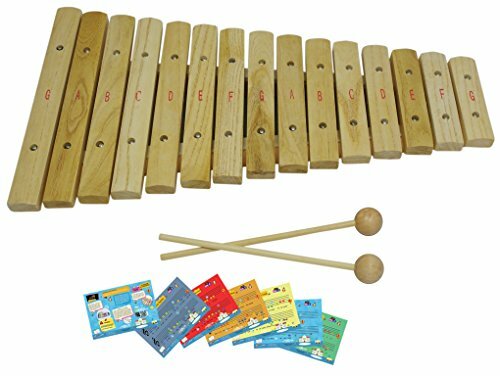 D'Luca 15 notes Wooden Keys Classic Xylophone, this tasteful Xylophone will give you or your kids endless hours of enjoyment. With this Xylophone they can start learning to play songs right away; it has a rich, warm tone, thanks to the wooden bars and Mallets. The letter notes are marked on each bar for easy visualization and blend perfectly with the natural wood color of the xylophone. Twinkle Twinkle Little Star, and more! Includes 2 mallet, 5 Durable full color double sided Music Cards 4"x6" with 10 (Ten) classic songs, Quick Start Guide Card 4"x6". For ages 2 and up. WARNING: ADULT SUPERVISION REQUIRED. Please remove all packaging material before giving this item to a child. Xylophone measurements are 17" x 9.5" inches approximately.